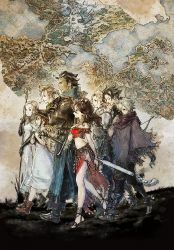 Originally released for the Nintendo Switch, Octopath Traveler is coming to PC on June 7. This will allow players to embark on an adventure in Orsterra as one of eight characters. Each has their own tales to experience, from quests of self-discovery to revenge, and they each start in their own land. The game will keep its 2D character design in the 3D world, as you can see in the media below, and will have both English and Japanese audio.